“The root of the land conflicts lies in the dispute over the use and control of territorial space stemming from the imposition of one culture over another. On the one side is agribusiness, where land is a space to produce and do business. On the other side there is indigenous and peasant culture, where land is understood to be a place for life,” stated the Chaco Argentina Agroforestry Network (REDAF) in a recent report. In late 2001 the Argentine economy collapsed. 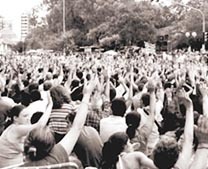 People’s bank accounts were frozen and the State offered nothing by way of a solution – the people went out into the streets, banging pots and pans, singing que se vayan todos (they all must go), and with popular power forced out four consecutive governments. Darío Aranda, I think, is a bit like Rodolfo Walsh. Like Walsh, Aranda has no place on the editorial staff of newspapers and media companies, even those that still fly the flags of the Open Letter to the Military Junta. He still works closely with campesino and Indigenous communities who resist in defense of their ancestral territories and ways of life. He doesn’t tolerate being enclosed in an editorial office, writing or editing what “reliable” news agency cables tell him to write. The biggest trial for human rights crimes committed by Argentina’s 1976-1983 dictatorship began Wednesday in Buenos Aires, with 68 people accused of crimes involving nearly 800 victims of the Navy Mechanics School (ESMA). For the first time, six pilots who flew the so-called “death flights” – where political prisoners were dumped from planes, drugged but alive, into the ocean – will be tried. “We don’t need other people to speak for us any more. We have our own voice now,” Armando Kispe of Queta, a Kolla indigenous community, said enthusiastically at the Pachakuti radio station. Radio Pachakuti is the first indigenous station to be licensed under the media law that was passed by the Argentine Congress three years ago and which is designed to guarantee access to the media by all segments of society and fight the growing concentration of media ownership by limiting the number of broadcasting licenses in the hands of media giants. 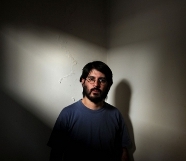 On October 10, Miguel Galván was murdered, stabbed to death in the doorway of his own home. Almost one year earlier, Cristian Ferreyra had been shot and killed in his house. Both men were peasant farmers from the northern province of Santiago del Estero and members of the National Peasant Movement of Santiago del Estero – Farmers’ Way (Mocase-VC) an organisation which fights for the land rights of peasants and indigenous people. In small communities across the Ramal Jujeño in Argentina Guarani women are rising up to defend their rights. On October 15 their struggle will receive international recognition, when Matilde Lucio be awarded one of 10 international prizes for her creativity in rural life in recognition of Rural Women’s Day.